NOTE: If the tips of the throttle plate screws have been flared out ex cessively by staking, it is ad visable to file off the flared-out portion to avoid damaging the threads in the throttle shaft when removing the screws. Be careful not to damage the throttle shaft while filing the screws. Discard parts marked with an asterisk (*) upon removal, as replacement parts for these items will be found in the Master Repair Kit. The following list contains the component parts of the lower body assembly in the order in which they are removed. Remove the pump operating rod pin (1) with a narrow blade screwdriver and slide the pump rod extension (2) out of the body casting. 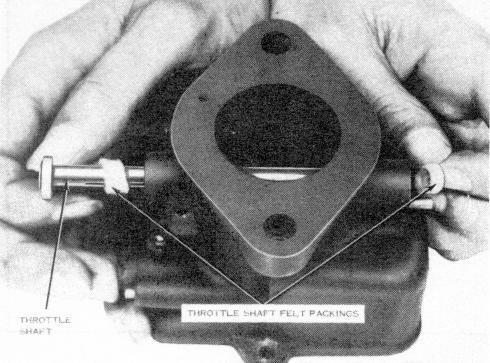 (13) Remove the throttle shaft (28) and the felt packing (27). Discard the felt. (14) Remove the distributor passage plug (29). If it is necessary to remove the float lever bracket, place a 5/8" steel block between the arms of the bracket, clamp the arms and block securely in a vise, and drive off the casting with a fiber mallet.